This month, we’d like to talk about GOALS. The word “resolutions” brings some negative feelings to some of you. We’ve heard you say “My New Year resolution is to not make a resolution” and we get it! Goals are tough to set and often even more tough to keep. We don’t like the feeling of “failing” so we don’t set ourselves up to do so, if we can avoid it. We want to take back this word and make it positive, hopeful and attainable in the dental world. There were actually more resolutions than these, but this is a great start! 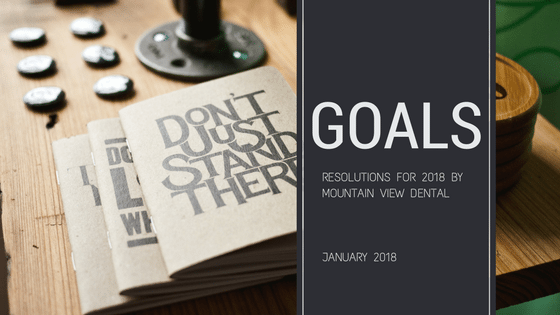 Achieving these goals would mean our dental office would run more efficiently which would help our patients and our team. It is important that these goals are not forgotten or given up on. To help us reach or work on our goals, we are discussing them every month at our team meeting. We’ve posted our goals in our break room so we can see it and be reminded. Additionally, we’ve looked into training opportunities in 2018 to help our team learn from the experts about the topics that interest them most and help them reach their goals. At the end of the day, we are all trying to improve in different areas of our lives and our workplace is definitely a big part of that. We strive to help each other and to make appropriate changes that would make your visits more enjoyable and seamless. We have also heard many people resolve to make their oral health a greater priority in 2018. You’re not alone! Even dental professionals have this GOAL because our lives are busy and our time and finances are limited so dental work can sometimes be a real strain. If you want to make your dental work a priority this year, but want to first talk about your financial options or treatment plan, please feel free to call our office and even schedule a consultation if you’d like. We want to help you achieve your goals this year. Thank you for reading and happy 2018!